Christmas is a day of grand celebration for all. It is celebrated with great fun and fervor across the world. In Chile, people decorate their homes with dazzling Christmas light, beautiful Christmas tree, balloons etc on this auspicious eve. Another important aspect of Christmas celebration is the beautiful gifts that people exchange on this occasion. The celebration can never be complete without exchange of Christmas gifts. The tradition and celebration of Christmas might be different in Chile but it incorporates the same enthusiasm and spirit all over the world. This celebration signify spreading love and happiness among fellow human beings. Like all other country, Christmas is celebrated with great fun and fervor in Chile.While decorating Christmas tree, people in Chile place tiny figures that are made up of clay. These figures are usually placed near the Christmas tree which is known as 'pesebre'. The decoration of the country carry remembrance of joyful Christmas experience. The Christmas traditions of Chile fill the very air with religious thanksgiving and love. The decorations Chile include nativity scenes, Xmas trees and figures representing the Holy Family and other religious characters. The midnight mass on Xmas Eve is where most of the people and families go. The families celebrate Holiday Dinner together in the evening. The favorite drinks are rompon and cola de mono. The gifts are unwrapped afterwards. People enjoy till the wee hours of the morning. 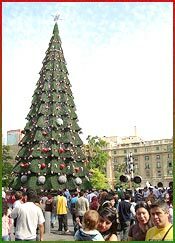 In Chile, the Christmas tradition is always a religious affair and Jesus Christ is always at the focal point of the celebrations. The church services are part of the daily activities during the season. Carols are sung while bible passages related to the nativity are also read throughout the period. Christmas Day is also a day to enjoy sports and nature. The people come to the beaches, go on rock-climbing or surfing, and most people simply enjoy the sight of these holiday spots.